The compact electric motor works with the petrol engine to improve fuel economy and lower CO2 emissions. The petrol engine, electric motor, Lithium-Ion Polymer battery and Dual Clutch Transmission are engineered to function together with optimal efficiency.They also combine to maximise acceleration when required. The specially calibrated 1.6 l GDI internal combustion engine delivers 105 PS with class-leading energy efficiency. High torque and high efficiency are the principal attributes of the 43.5 PS electric motor. It delivers impressive acceleration when starting, and can add extra power at higher road speeds. 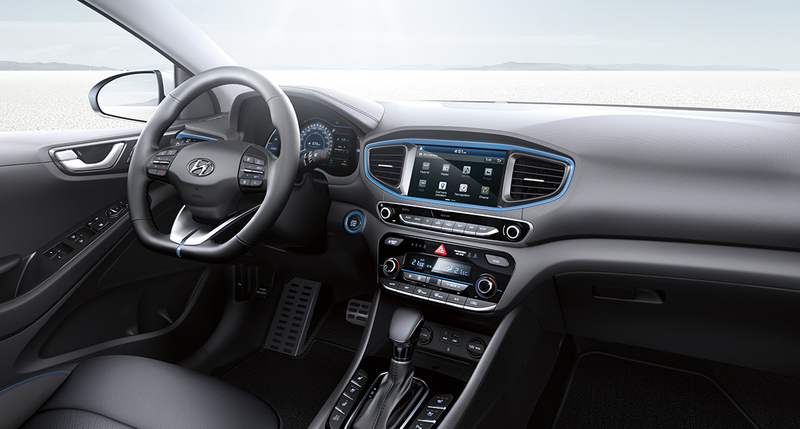 Inside the IONIQ, the weight of interior plastics has been reduced by approximately 20% through the use of a material made of recycled plastic combined with powdered wood and volcanic stone. Secure rear collision space and additional cargo capacity have been achieved by positioning the battery underneath the rear seats. A driver’s airbag, passenger’s airbag, side airbags and curtain airbags protect passengers in the event of a collision.